ON THE GO OC - Things to do with your family. : Lucille’s Smokehouse Bar-B-Que Teams Up with Autism Speaks to Giveback in a Big Way! Lucille’s Smokehouse Bar-B-Que Teams Up with Autism Speaks to Giveback in a Big Way! To Increase Acceptance and Understanding of Autism Family-owned, award-winning barbeque destination Lucille’s Smokehouse Bar-B-Que is teaming up with Autism Speaks to help increase understanding and acceptance of autism. The April campaign marks World Autism Month. Our family was blessed with our son 5 years ago. Around 18 months I noticed behavioral and cognitive delays. Autism diagnosis came at age 3 and we have worked very hard with our son and his team to bring him to meet and exceed goals at hand. We are so grateful to Lucille's for giving back and helping spread awareness for Autism. Here are the deets:During April, Lucille’s will donate to Autism Speaks the Round It Up America contributions – in which guests “round up” their purchases to the nearest dollar – at 22 participating locations throughout Arizona, California and Nevada. 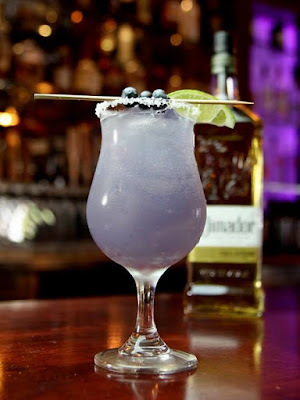 Lucille’s will also be serving up a ‘Blueberry and Basil Margarita,’ a blue drink inspired by the color of Autism speaks, that combines El Jimador Reposado Tequila, fresh basil, vibrant blueberries and is then hand-shaken with agave nectar and fresh lime juice. For each drink sold, Lucille’s will donate an additional $1 towards their final donation to Autism Speaks. People with autism spectrum disorder may have challenges with social skills, repetitive behaviors, speech or nonverbal communication, but they also may have unique strengths. An estimated 1 in 68 children is on the autism spectrum. Last year, Lucille’s two Las Vegas restaurants raised about $2,000 for Autism Speaks. This year, Lucille’s hopes to raise more than $30,000 to help the nonprofit organization support research into the causes and better interventions for autism. Lucille’s restaurants are reminiscent of a Southern roadhouse with a distinctive Southern décor that features reclaimed wood outline doors and windows for a rustic yet contemporary look. Lucille’s features blues-inspired art throughout the restaurant and the Flying Pig lounge. Lucille’s has been participating in Round It Up America, a platform that encourages restaurant guests to donate change; over the past ten years, Round It Up America has collectively raised millions of dollars for charitable organizations and programs across the country. Thank you to all who come out to support!